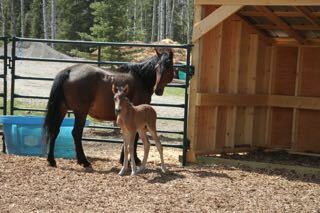 Finally “Queenie” our older rescued mare, delivered her foal this morning. The family that is going to adopt her with her foal, named the baby “River” if it was a colt. So “River” it is. Both “Queenie” and “River” are doing well. He is a very strong and energetic one day old baby. It was a nice sunny day and all the young ones and the mares were soaking up the warmth. 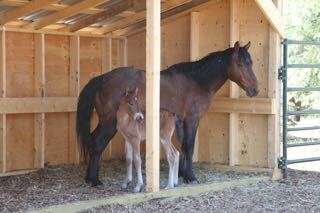 As it sits now we have two wildie foals and and two rescued mares with foals. This makes it such a joy to be at the site and being blessed to be able to watch the antics of these new babies. The AB government should leave the wild horses be… There are more cows than wild horses, so it’s unrealistic that the horses are the ones overgrazing on pasture land…. I’ve just finished watching CTV’s program about the wild horses in Alberta. It’s incredibly frustrating to see this and never really get any answers about all these studies that have apparently been done. I’ve never seen so many people speak from the sides of their mouths and blatantly lie. I guess all I wanted to say is that I appreciate the work your group does and really hope that the new NDP government will take a closer look at this issue and take the ranchers out of the pockets of those who continue to let this travesty continue. It makes me sick to think about what is being done, with no real science to back anything up. Thank you. I have read and watched loads about the wild horses of Alberta. I can’t believe we blame the few wild horses we have left for destroying the grazinglands yet the wild elk are just fine? The Alberta gov. needs to keep up with the times and learn that technology has changed and with that our thinking around land and horse management should also change. Inside the box thinking to keep beef ranchers happy should be abolished. Get out of the pockets of beef ranchers and consider that wild horses are part of our heritage and worth protecting. I’ve mostly seen the horses in the winter, pawing thru the snow to get at what the cattle left behind. Besides as I understand it the horses were here first.